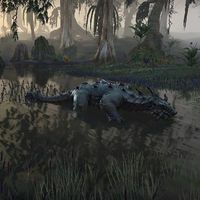 Wamasu, or "Swamp Dragons", are large reptilian creatures that inhabit Black Marsh. 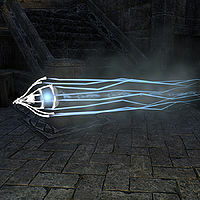 Their sturdy hides and luminescent inner organs are well valued in Tamriel markets. Northern men have described them as intelligent dragons with lightning for blood, as they have the ability to strike out with wild electrical discharges. Warthogs are a type of boar known to be kept as exotic pets. 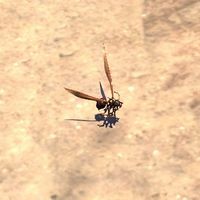 Wasps are small insects. See also: Giant Wasp. Watchers (also called Doom-Truths) are flying tentacled Daedra. A type of octopode that can be found on Artaeum. Welwa are great four-eyed beasts, with thick pelts, tails, and savage teeth. They hunt in packs. 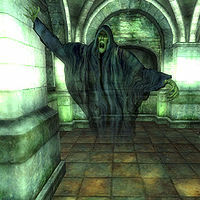 According to tapestries in the Crystal Tower, the early Aldmeri settlers of the Summerset Isles encountered welwa, depicted as strange, holy ravagers, and saviors of the land. Led by Torinaan, the Aldmer of Auridon drove them back using ancestral magics, and eventually the welwa of Summerset were driven to extinction. However, welwa continued to inhabit the wilds of Craglorn on mainland Tamriel. They are often domesticated and armored by the Iron Orcs of the region, who use them as war beasts. 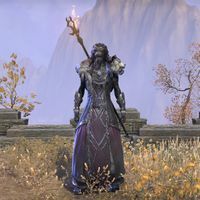 In the Second Era, the Sapiarchs of the Crystal Tower reintroduced welwa to Summerset Isle by bringing in mated pairs from Craglorn. These welwa quickly spread across the wilderness of Summerset, although many inhabitants of the Isle were displeased with their reintroduction. A variant of lycanthrope found in the swamps of Valenwood. A large form of lycanthrope said to be prominent in northern tundras of Tamriel. Almost thought to be folklore in Nordic cultures. Legend holds that smearing canis root on the trees surrounding one's home wards off werebears. Hunting packs of this strain have been found on the island of Solstheim. A lycanthrope of the boarish persuasion which attacks with both fore arms as well as its long teeth. 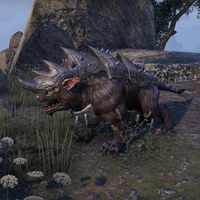 It requires silver or better weapons to be hit and anyone it bites has a small chance of becoming a wereboar themselves. 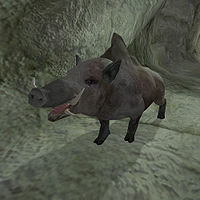 The wereboar is found almost exclusively in High Rock. A lycanthrope known to lurk in isolated swamps of Black Marsh and southern Morrowind. 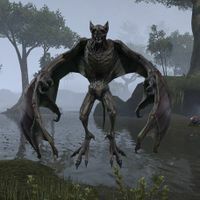 A lycanthrope found in Elsweyr, Black Marsh, and Cyrodiil. A mysterious lycanthrope with no reputable sightings and possibly created by folklore or myth. A lycanthrope found in Valenwood. The most common of lycanthropes found in Tamriel. They are monstrous, wolf-like creatures taller and broader than man and mer, and are capable of moving on two limbs or sprinting on all four. They can attack with both their claws and teeth, inflicting lycanthropy with their bite. Those with the beast blood are prone to violence, whether accidental or intentional, as they live with a constant bloodlust which drives them to kill and devour their enemies. 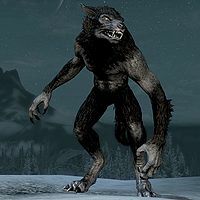 Werewolves are widely feared and hated in Tamriel, and will be attacked on sight if spotted in beast form. While Sanies Lupinus causes all werewolves to transform under the influences of the moons, the members of the Circle can control their beast forms. In return they must serve Hircine in the afterlife. Silver weaponry is very effective against werewolves. Not much is known about werewolf lords except that they are savage leaders of a lycanthrope pack. Like Sable man-beasts, their werewolf appearance is beast-like even while in a humanoid form. they seem to be more intelligent and less primal and are able to cast magic and use weaponry. The most notable was one of the first turned werewolves, Vykosa, who was so powerful that she could even bend the will of other werewolves. The Werewolf Behemoth form was an experimental werewolf form created by Vykosa's Archivist Ernarde around 2E 582 which granted the werewolf amplified strength and size, allowing them to become unstoppable warriors should they survive the process. 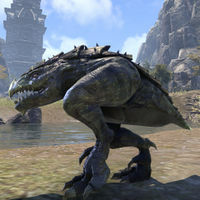 Whales are gigantic aquatic creatures rarely seen in Tamriel. 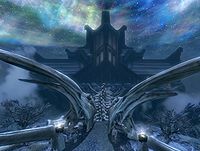 The legendary Whalebone Bridge of Sovngarde is made from the spine of a whale. The ancient Nords revered the whale as a deity in their traditional animal worship. 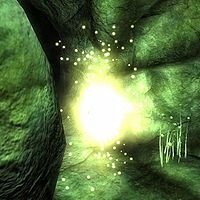 This wisp-like creature can be found in the Soul Cairn. The undead creatures of this realm are often found hunting these creatures. They are seemingly impervious to all attacks. 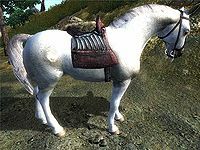 One of the five breeds of domesticated horses available in Cyrodiil. Will-o-the-Wisps are luminous beings seemingly composed of gas. They are immune to normal damage and poison, and have a variety of extremely dangerous magic. They are also very fast and have the ability to become nearly invisible. They're found in swampy areas of Tamriel. Can only be harmed by silver, daedric, or enchanted weapons. 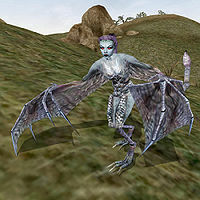 A Harpy-like, female-form Daedra with bat-like wings. They operate as messengers of Azura. Winged twilights are resistant to fire, frost, poison, and shock and can reflect spells. 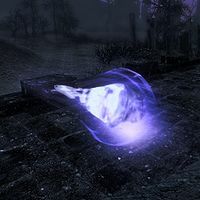 Ichor extracted from a winged twilight can be used to brew potions of levitation. Wisps are floating ethereal creatures that are usually found around Wispmothers, but they can potentially be found on their own. Killing a Wispmother also kills the wisps surrounding her, leaving only glow dust behind. Wisperills are luminescent films which float through the air in the realm of the Hist. They perform slow, colorful dances in the air. They were named by Mere-Glim and Fhena when Umbriel was brought to the realm. 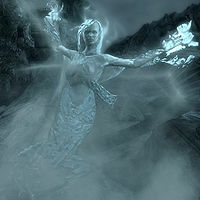 Wispmothers are magical energy beings found in the wilds of Tamriel, primarily in Skyrim. These spirit women appear to be either a higher form of Wisp, or creators of them. Able to teleport and restore their health, Wispmothers can also summon multiple shades, which are weak clones of themselves. Killing a Wispmother causes all of its attendant Wisps and Shades to die. More powerful Wispmothers are also capable of some form of necromancy; where they send out wisps to possess and reanimate nearby corpses. Many legends and theories exist which seek to explain the true nature of the Wispmother. Locals variously believe them to be remnants of the ancient Snow Elves, ghosts or natives of Hjaalmarch. Master Sadren Sarethi proposed that they are a forgotten type of lich from the First Era. Lydette Viliane of the Synod proposed that they are elemental personifications of snow or mist. 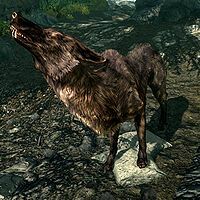 Wolves are cunning, dangerous hunters found throughout Tamriel. They use their highly developed sense of smell to track their prey. They hunt in well organized packs, and are known for their ferocity in battle. They are the wild ancestors of the domestic dogs. 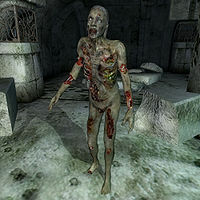 Worm Thralls are a type of zombie created by the Order of the Black Worm. Initially, "Worm Thrall" was simply the title applied to the order's lackeys. The order has been known to turn people into Worm Thralls both as a punishment and as a method of preserving them for prolonged study. 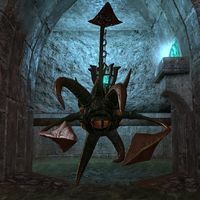 Notably, Vanus Galerion and several other past Arch-Mages of the Mages Guild were raised as Worm Thralls by Mannimarco. Wormmouths are a type of vermin native to Hammerfell. They have a small maggot shaped body propelled on two legs. The mouth is almost as large as the rest of the body, and has three protruding claw-like teeth. Wraiths are the ghosts of powerful wizards. They are very dangerous, and often possess spell-casting abilities. Like all ethereal undead, only silver or better weapons can do damage to a wraith. 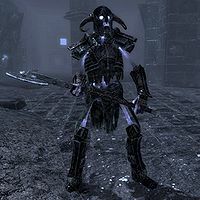 Wrathmen are skeletal undead found in the Soul Cairn. This page was last modified on 28 March 2019, at 21:18.